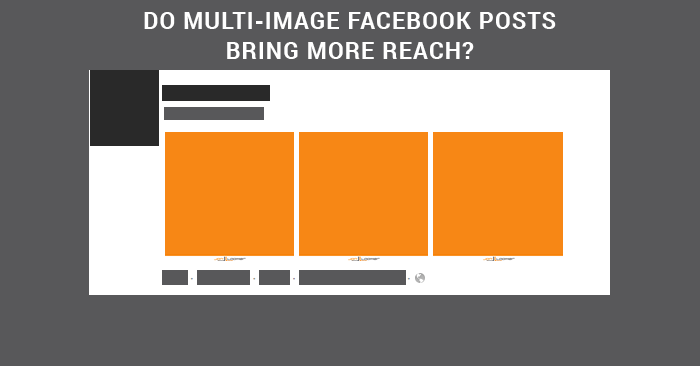 Do Multi-Image Facebook Posts Lead to Increased Reach and Engagement? During the past couple of months, I’ve had several people tell me of a trick they found to increase Facebook Reach using multiple images in a post. I don’t chase Reach, so I found the concept somewhat interesting, but I was skeptical. The rumor goes that if you create a post with multiple images in it, you will reach far more users than if you do a typical image share. Note that this isn’t sharing a photo album, but doing a standard text share while adding images. In the example above, you can see that this is done within the “Status” area of the publisher. 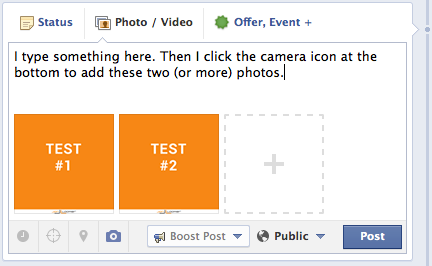 Type your message and then click the camera icon to add multiple images from your desktop. The key is for the images to look presentable when uploaded together. If you post two or three images, all will be presented side-by-side within the News Feed, on your Timeline and within the permalink. Reach is fine (actually, I really don’t care), but Patrick highlighted a couple of more important points: The decor page saw a 989 % increase in post clicks while the apparel page saw 870%. In each case, this happened even though fewer stories were generated. If you post 2 images instead of 3 its a better look in the news feed. 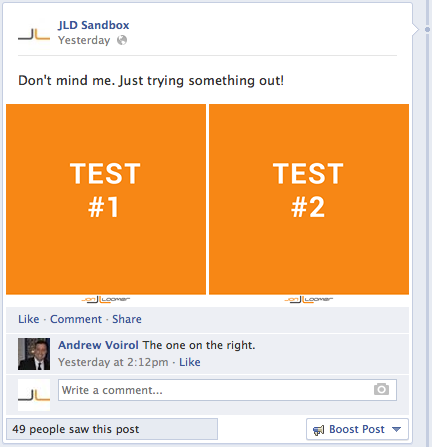 Not only is reach up on these types of posts, but my engagement is up too (yay!). Yes I post 3-4 pics at a time and get 2-3 times the reach even with same likes/comments. 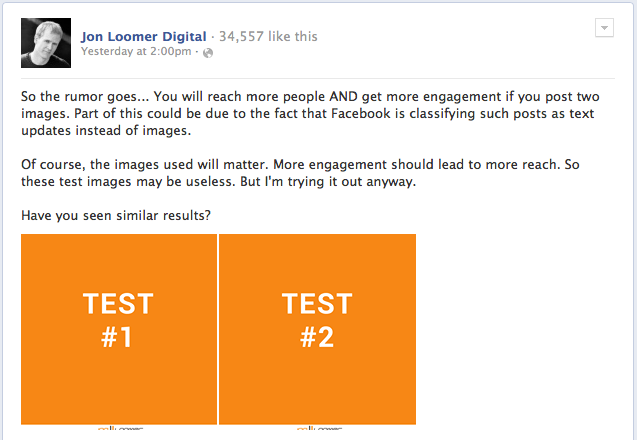 Conventional FB logic says that the middle post should get much higher reach because of all the comments. But the Top post and the multiple images definitely shows that your rumor seems to be correct! Have seen that actually, with a page of 4,200+ likes. Multiple images reach like 3000 while text 2000 and links around 900-1000. Okay, very convincing. But I’m always skeptical of any “tricks” to get more Reach. Word of such things spread quickly, but people often focus on the results that they want to find. And any “trick” that focuses on Reach isn’t all that interesting to me. But the talk of an increase in engagement got my attention. So I decided to give it a whirl. The post did very well. It received 37 comments, 86 likes and 11 shares as of writing this blog post. The Reach was at least double what I’ve seen for a single image post lately. But most impressively, it accumulated nearly 2,000 consumptions (post clicks). It’s tough to take much from this. While the post did do very well, it’s difficult to determine how much of that was due to the method of sharing and how much due to the subject matter. It got a ton of engagement, but how much of that was due to an increase in Reach? And how much of the increase in Reach was due to the added engagement? Also, my example only scratches the surface because I used test images. This was intentional, however, since I was looking to get to the core of whether posting method mattered — I didn’t want the images themselves to influence the results. 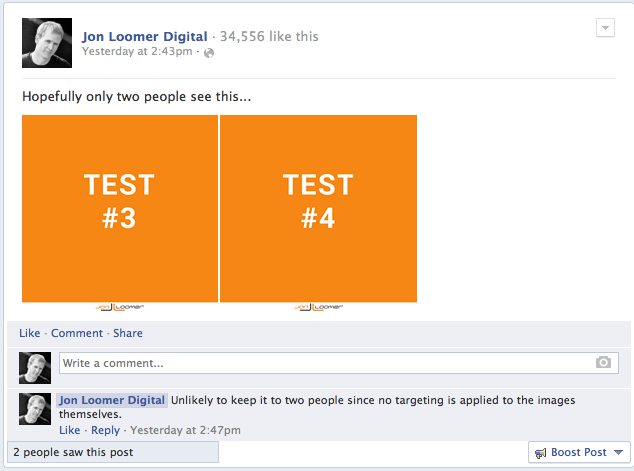 But this test got people excited and a flurry of engagement resulted. So I can’t really take much away from this test. Still, I’m convinced people are seeing results. So the question is, why? One theory is that Facebook classifies such a post as a text update, thereby giving them the typical Reach of such a post. Well, I’m getting conflicting info on that. It’s possible that Facebook is still treating it as a text update, however, and that their systems are confused. It’s certainly a theory to consider. There was also the possibility that Facebook was miscounting as a result of showing multiple images within the same post. For example, Facebook may have been counting the same person as a unique user when they saw the post and when they saw each individual photo. Only my wife and I saw the post, confirmed also in the post level export. We both clicked into the photos multiple times as well, and that didn’t impact the reporting (also a strange tidbit: Facebook didn’t report our photo views). There’s also the possibility that this is all very normal and natural. One photo can get a lot of engagement. Photos often get the most clicks. You add another photo (or more), and it just makes sense that such posts would receive more engagement. The main thing with such posts is that you’re adding up the engagement of each individual photo as well as the post itself. When done appropriately, it makes a whole lot of sense that you could get a ton of engagement. And if you get a ton of engagement, the Reach should follow naturally. Based on the reports I’ve heard from others, there’s a very real possibility that such posts are receiving more Reach than you’d expect from photo posts. What isn’t entirely clear is whether this is unnatural. 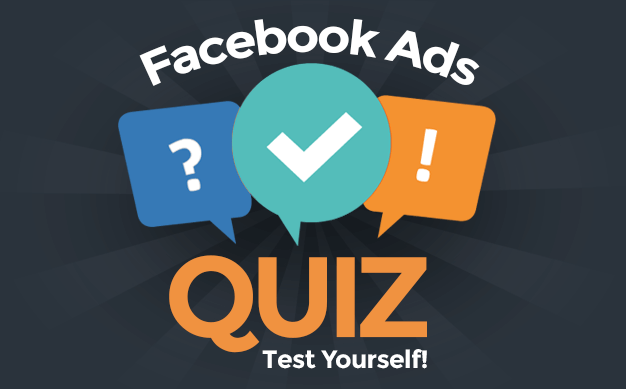 Are you somehow “gaming” the system to get Reach and engagement Facebook is not intending? My gut says no. But more testing is needed. Let me be straight with you: I hate topics like this one. I hate when someone finds a new trick to game the system, and then everyone and their moms start doing it, too. All in the name of Reach. You should look at this first in terms of utility: Do you think that sharing multiple images in this way will provide value? Is it something you think your fans will respond to? That’s what I’m most curious about. And as I see how they are displayed, I think it’s entirely possible that this could be a very effective way to share content with my audience. Quick Tip: In my test, I only used square images that were 1200×1200 pixels. 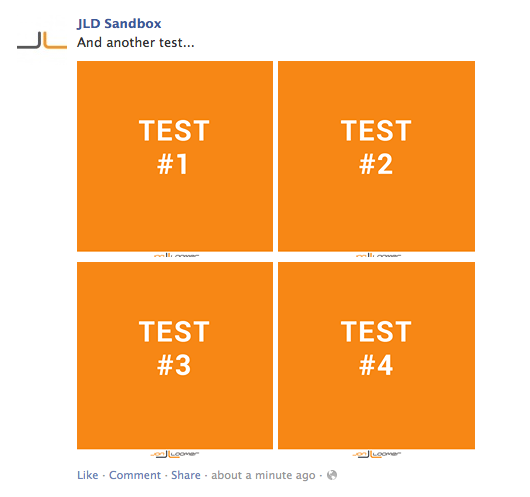 Facebook appeared to crop out the outer 5px or so, but kept each image square. I plan on experimenting with it. I recommend you do the same. But when you do, make sure you look beyond the metric of Reach. Does it lead to more engagement? More stories? More website traffic? More sales? When you report back to me, please focus on these things. Have you experimented with this technique? What results are you seeing?